Mastiff Lovers & Dinosaur Poop! Giant dog breeds and their owners are often subject to incredulous questions starting with "Why?" and "How?". "Why on Earth would you want such a BIG dog?" "How do you walk him/her?" "How much do they eat?" "How much do they poop?" To answer this last question, they poop a lot! In fact, my children and I jokingly refer to the dogs dung as 'Dinosaur Poop' because of the size. What goes in must come out, essentially, but, with a healthy high quality dog food, digestion is much better, which means well-formed, easier to pick up 'poop'. Now that we've gotten that out of the way, hopefully this article will settle some of the other curiosities on the choice to own a giant breed dog, specifically the Mastiff breeds. First and foremost, owning a dog, or any pet for that matter, must be something you think long and hard about before purchasing. Considerations such as affordability for food, veterinarian costs, home and exercise areas. One of the most important things one must consider is time available for the new family member. Obviously if you've decided to go with a Goldfish, these considerations don't apply. If you are considering a canine companion, then all the above should be noted. There are many Mastiff hybrids and although we aren't covering all, we are focusing on the most common to my knowledge. These being the English Mastiff (aka Olde English Mastiff) French Mastiff (aka Dogue de Bordeaux) and Bullmastiff. Whenever I hear someone mention 'Mastiff' I feel my ears perk up and my heart swells a little. I truly love these dogs, but of course they aren't for everyone. Large or giant breed dogs such as Mastiffs don't necessarily need the extensive amount of exercise that their smaller canine friends may. The Mastiff breeds are often quite literally big 'couch potato' types and are quite happy with a walk around the block once per day. A fenced in yard is definitely suggested when you have a dog of any size, both for their safety and for your piece of mind. I've known people who live in apartments who own these gentle giants, and all live quite happily in their contained quarters. Remember though, bathroom duties are inevitable and the larger the dog, the bigger the poop! Living on the top floor of a 6 story building might prove as extra exercise for the both of you. Not necessarily a bad thing for some! Mastiffs are people dogs. They want to be with their 'people'. Mastiff's are not happy left in the yard if you're not with them. Nor are they happy sitting at home for long periods of time alone, which again is important before choosing your canine companion. Leaving a Mastiff alone for long periods of time will lead to some sort of bad behaviour, which could include destruction of mass proportions! Have you seen the movie Turner and Hooch? Starring Tom Hanks? If not, you might want to take a peak. Actually it's a wonderful, funny story about a man who inherits a French Mastiff unwillingly, and how the two of them become best friends. Hooch goes to the extreme, but I've known of similar stories when owners have mistakenly thought their sweet pooch would be fine sitting in the house alone for a whole eight hour day. Mastiffs will happily sit by your feet, or on them if you let them, just to be near you. They crave affection and attention and of course praise. They also love to give love. These dogs are nurturing to both their human family and other animals they live with. Below is a picture of Leo cuddling the new Boxer pup who was scared the first day he came to live with their new family. Mastiffs have big hearts and show their love and affection for all their family members. These sweet pooches love with all their might, drool and slobber. Yes, most do slobber and or drool. Not all the time, not all Mastiffs, but depending on the type/breed some do drool much more than others. I have both a French Mastiff (aka Dogue de Bordeaux) and a mix of French and English Mastiffs. My French Mastiff drooled excessively when she was less than a year. She now only drools when feeling unwell, which is hardly ever. The mixed Mastiffs seem to have the same habits. Drinking and keeping water only in their mouths and dish is an entirely different story. 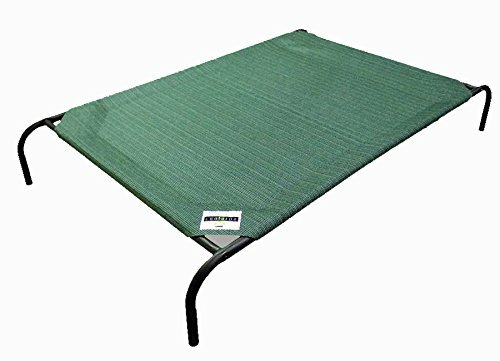 A large bath mat would be suggested to keep under the large water dish as Mastiffs tend to drink and hold water, for some odd reason, after they've left the drinking station. I've had them come visit my lap on the other side of the house only to give me a smile and dump half a cup of water on my pants, on more than one occasion. That being said, I suppose if you are someone who despises any disorder, maybe a Mastiff wouldn't be for you. Children and small animals are often very compatible with Mastiff breeds. Our family has always had large breed dogs and cats as well as other small animals at times. The cats often cuddle up beside the mastiff or take to cleaning the dog's face or ears. I have 4 boys and they grew up with these large canines who were gentle and wonderful companions always. 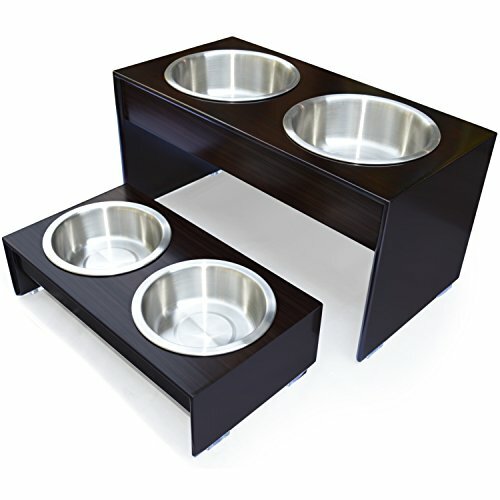 A definite necessity for the large breed dog! Easier digestion and ergonomically correct! Although these large canines are sometimes oblivious to their strength and size, they are generally very gentle and loving towards their family and friends. Unfortunately their tails can sometimes cause a welt or two if the dog is overly excited or happy. Stay clear of the hind end and you should be fine. Your Mastiff will love you more than life itself, so be sure to love back with equal ferocity. Amazing savings on this incredibly comfortable bed for your sweet pooch! 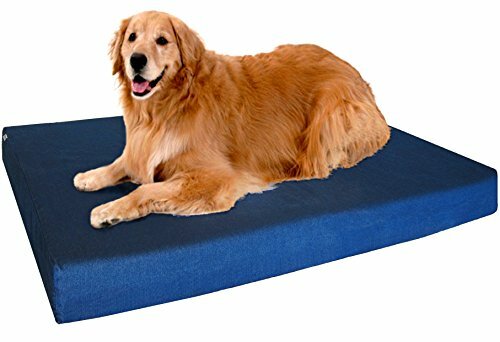 The orthopedic memory foam is sure to please your large canine family member and the sturdy, re-washable cover makes this an excellent choice for dog lovers everywhere! I would consider the Mastiff breeds as watch dogs, but not guard dogs. Mind you, I haven't needed protection by them, but they certainly have loud deep barks which become louder and deeper if they feel that their family (meaning you and yours) are at risk in any way. That being said, they aren't normally aggressive dogs. They're more apt to lick you to death then hurt you in any way. If you don't socialize your dog with other dogs and people outside your family the Mastiff will often behave timidly when around others they don't know. It's important to socialize your dog so that they realize they don't have to be afraid. Taking your dog for regular walks where they are bound to see other humans and animals will help them to overcome any timid behaviour. Another consideration for those of you wanting to add a Mastiff to your family. There are a few health concerns to these gentle giants, and those being that some have tendencies to bloating, and due to their size, both hip dysplasia and elbow dysplasia could be serious concerns. Eye disease is another issue with some of the Mastiff breeds. If you are going to adopt through a breeder, you should be able to acquire a background check on the dog indicating genetic traits and areas of concern. Some breeders state that by carefully monitoring the food intake as the dog matures from pup to adult you can avoid hip and elbow problems as these can be due to growing too quickly. We feed our dogs 3 cups of a holistic brand in the morning and the evening. Some days they eat all of their meal, other days only half. They aren't overweight, they're happy and healthy. Take the time to speak with your breeder and vet when deciding on the feeding amount, type and schedule. When it comes to grooming, the Mastiff breeds mentioned in this article aren't big 'shedders'. Their hair is short and easy to groom. We brush our dogs at least every other day, which helps loosen and remove any dust, dirt or smudge they may have picked up while playing outdoors. They love to be brushed as I'm sure it's kind of like having your back scratched, and sit nicely while loving the extra attention. Bathing is recommended no more than every 2.5 - 3 months as per my vet. This is because of sensitive skin issues and the more often you bathe a dog the more often you are stripping the natural oils from their skin. Obviously you may have to bathe your pooch more often due to incidents beyond your control, such as mud rolling, or anything else they might find to get into. At these times, I would recommend using just water if possible (as long as there's no stink involved) or if needed a very mild dog shampoo. Last but not least, these dogs have a wonderful sense of humour and you will notice they'll try to make you laugh and smile over and over again once they've found your 'funny bone'. Our Maggie will smile on command, which is difficult for her to do because of her large jowls. It's funny and cute and sometimes she will just come over to me and put her paw on my lap and smile. Love your dogs as you do your whole family and they will love you back in kind. 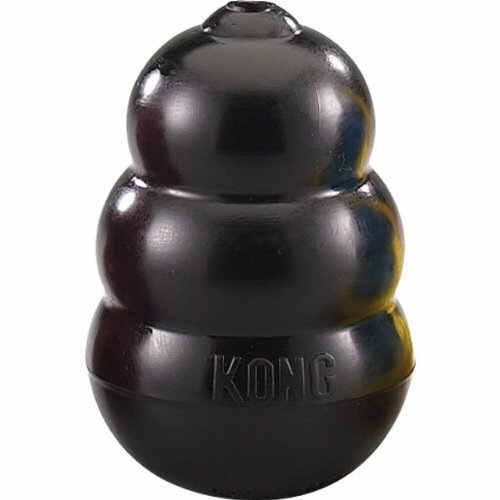 Stuff this Kong with peanut butter or dog treats of your choice! Your pooch will be busy for quite awhile with this 'must have' toy! Durable and safe, the Kong Extreme is an excellent gift for the dog lover's dog! THAT's a LOTTA dog!!! Good piece, thumb's up! Helpful article on these big dogs. I have to say that some of them have a face (in my opinion) that only a mother would love them. Although they are good dogs, but not keen on the dribble either.